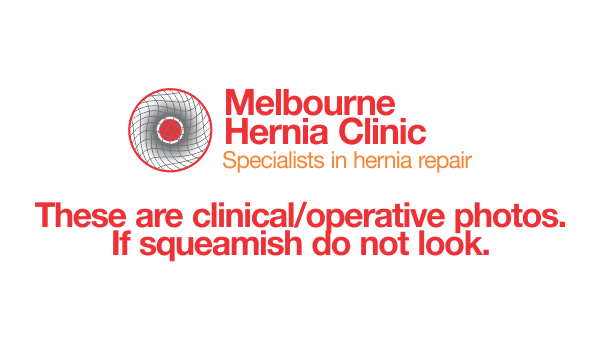 Inguinal hernias are the most common type encountered in surgical practice (approx. 80%). They are far more common in men than women. They occur at any age – from the newborn to the elderly. In men the descent of the testes at birth has left the abdominal wall in this region more prone to weakness and herniation. At birth there is a sac, which if it does not shrivel up, leads to the development of a hernia. With ageing, as the muscles undergo attrition, this can also cause a hernia. Straining and lifting are common factors associated with the development of a hernia. There are two basic types, but they both protrude through the superficial external ring of the inguinal canal in the groin. The INDIRECT descends along the spermatic cord in males from the deep internal ring. Or the round ligament in females. The indirect occur at any age, from infancy to the elderly. In children or females the hernia is invariably indirect. Direct herniae occur with increasing frequency in males as they age. The persistence of the processus vaginalis sac at birth associated with and following the descent of the testis results in the development of indirect herniae in children. This is the congenital type of the sac. With incomplete descent of the testis (undescended testis) there is usually an associated indirect hernial sac. Undescended testis is a common condition of infancy. It requires surgery to place the testis in the correct position. It may not be diagnosed early and this can cause problems. The testis in infancy, childhood and adolscence may undergo torsion ( another surgical emergency). Persistence of a patent process vaginalis is also responsible for communicating hydroceles of the testis and encysted hydrococeles of the cord. There is conjecture as to whether this congenital type of sac (persistent patent process vaginalis) is responsible for the development of indirect herniae in adults or whether the herniae developed as a new event, associated with failure of the muscular shutter mechanism at the internal ring. The ‘congenital sac’ theory assumes there is a congenital sac which only fills with contents in adult life. It is not always possible to distinguish clinically between a direct and indirect inguinal hernia. It is uncommon for direct hernias to reach down into the scrotum, and they are generally smaller. It is common for direct hernias to bulge forward. They are often bilateral in the older person. The impulse as detected by palpation at the internal ring, is directly forward rather than obliquely. Pressure over the deep internal ring will prevent the descent of an indirect hernia but not a direct hernia. Below are clinical images of hernia surgical procedures. Please do not look if you are squemish. This is a larger hernia in an elderly man descending into the scrotum. This hernia is in danger of strangulation. This is an average size right inguinal hernia. There is an obvious swelling in the right groin. Another indirect inguinal hernia. It consists of fat which in this case was removed before repairing the defect. Typical fatty inguinal hernia at operation. The skin is being retracted for better exposure. 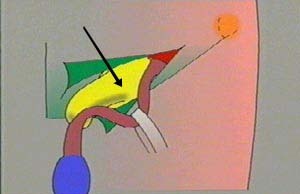 The plastic tubing is retracting the cord which contains the blood vessels to the testis and the vas which conduct the sperm. It is important not to damage these structures. The surgeon can either cut out this lump or push it back in.